On Friday, Filipino authorities tied at least three deaths to the 2016 deployment of Dengvaxia, the world’s first dengue fever vaccine, Reuters reported. “Three cases were found to have causal association. They died of dengue even (though) they were given Dengvaxia. Two of them may have died because of vaccine failure,” Health Undersecretary Enrique Domingo told a news conference. 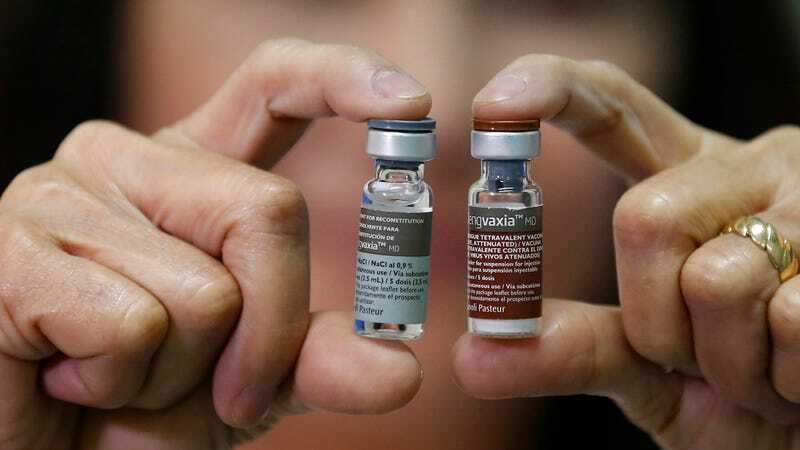 Health authorities in the Philippines have conceded that the mass immunization program could have waited until safety trials on Dengvaxia to be concluded, in which case doctors would have known not to give the vaccine who had not previously been in contact with the virus. Yet it’s easy to see why they were eager to roll out the vaccine: Dengue is endemic throughout the region and causes up to 200,000 infections annually in the country. Up to 400 million people each year get dengue fever, according to the Centers for Disease Control. As many as 500,000 of those cases progress into dengue hemorrhagic fever, which kills around 25,000 annually. There is no other known preventative measure other than exterminating mosquitos or preventing them from biting humans. The disease used to be mostly contained to a handful of countries but has since spread like wildfire to more than 100 countries, according to the World Health Organization, and recent research indicates that it could spread to Europe thanks to climate change. Decades of research have proven that vaccines are safe and effective, though carry a small chance of side effects. When approving vaccines, health authorities generally ensure that the benefits greatly outweigh those possible side effects, and repeated studies have shown serious reactions to vaccinations are very rare. However, anti-vaccination activists who refuse to accept the scientific consensus on vaccine safety have grown in power in recent years, thanks in part to social media, and have been tied to outbreaks of preventable disease.